*First year free is a limited time offer and is activated after the first transaction. Annual fee will appear on initial statement and a credit will be applied on the second statement following the transaction. Meridian™ reserves the right to modify or withdraw this offer at any time without prior notice. Insurance coverage is underwritten by American Bankers Insurance Company of Florida (ABIC). ABIC, its subsidiaries and affiliates carry on business in Canada under the name of Assurant Solutions®. ®Assurant Solutions is a registered trademark of Assurant, Inc. Details of insurance coverage, including definitions, benefits, limitations and exclusions, are in the Certificate of Insurance. The Certificate of Insurance is available online at meridianvisa.a. Insurance coverage is subject to change. All Visa Infinite offers, benefits and series made available through Visa are subject to complete terms and conditions, including third party suppliers’ terms and conditions, available online at visainfinite.ca. Are you an avid traveller, looking for a credit card that will reward your passion for jet-setting with a comprehensive travel insurance package to boot? If you are, then this card might be for you! 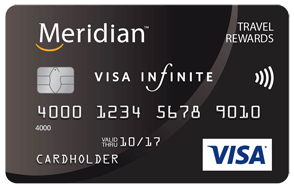 The Meridian™ Visa Infinite* Travel Rewards Card earns 1.5 points for every dollar you spend1. This rate increases to 3 points for every dollar you spend in foreign currency, making it a good choice for frequent flyers and dual nationals who spend a lot of time abroad1. You accrue points when booking flights, hotels and cruises, but you also earn them on everyday purchases, making this card a good choice even when you're home. Furthermore, there's no annual fee for the first year*, and once you have enough points to start redeeming them, there is an abundance of travel and merchandise options to choose from. So, how does this card stack up to other travel rewards credit cards? We crunched the numbers using our Best of Finance methodology to see how much you could earn over a 24-month period. Rewards earned over a 24-month period: 44,026.56 Meridian Rewards Points. This is enough points to get a 7-night Caribbean Cruise through the Meridian Travel Rewards program! This is a very conservative estimate based on the spending habits of the average Canadian. If you do travel and spend money in foreign currencies frequently, though, your points return could be twice as high. You should also factor in the money you save on travel insurance with the comprehensive insurance package from Visa included with this card. Earn 3 points for every $1 you spend in foreign currencies. Also earn 1.5 points for every $1 you spend on everyday purchases, and when planning your next trip. You can choose from over 100 airlines and more than 80,000 hotels! No annual fee for the first year*. Redeem your points for travel experiences, merchandise, event tickets, gift cards and more. With Visa Infinite benefits, you get access to exclusive dining events, VIP treatment at luxury hotels, and even your own 24/7 concierge over the phone4††. Travel insurance coverage includes baggage insurance, rental vehicle insurance, trip interruption or cancellation insurance, travel accident and travel medical insurance4††. Take advantage of extended insurance coverage, including purchase protection and extended warranty3††. Emergency health care coverage is provided4††. Mobile device insurance provides up to $1000 if your smartphone or tablet is lost, stolen or damaged3††. Global customer service support over the phone, available wherever you go! Annual fee is $99 after the first year of cardmembership. Each additional card costs $30. In order to qualify for the card, you must have a personal annual income of $60,000 or a household annual income of $100,000, meaning this card may not be for everyone. Coverage up to $5,000,000 per insured person for eligible medical care and services required, including transportation, repatriation, living expenses and dental care. Duration of coverage for each trip is dependent on the insured's age group up to age 75 and for up to 48 days. Coverage automatically doubles the original manufacturer's warranty for up to a maximum of one additional year. Maximum of $10,000 per item up to a maximum of $50,000 lifetime per account.